Roasted Chestnut Dressing is a rich and buttery stuffing recipe using roasted chestnuts, apples and raisins. The perfect holiday side dish! Preheat oven to 350 degrees. Coat a 9x13 baking dish or casserole with cooking spray. In a large mixing bowl, mix chestnuts through black pepper. Pour in the chicken stock, butter and cream and mix until evenly moistened. Spread into baking dish. Bake for 1 hour. Remove and serve! It is very tasty withCumberland Sauce! This recipe can be used as a turkey stuffing, but cut in half and do not stuff the bird to the brim. Make sure the internal temperature of the turkey is correct. 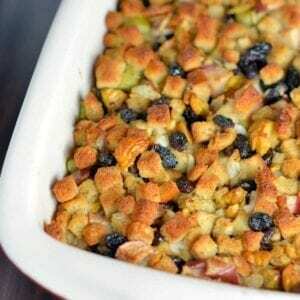 Since stuffing contains no raw meat, you'll be good to go!